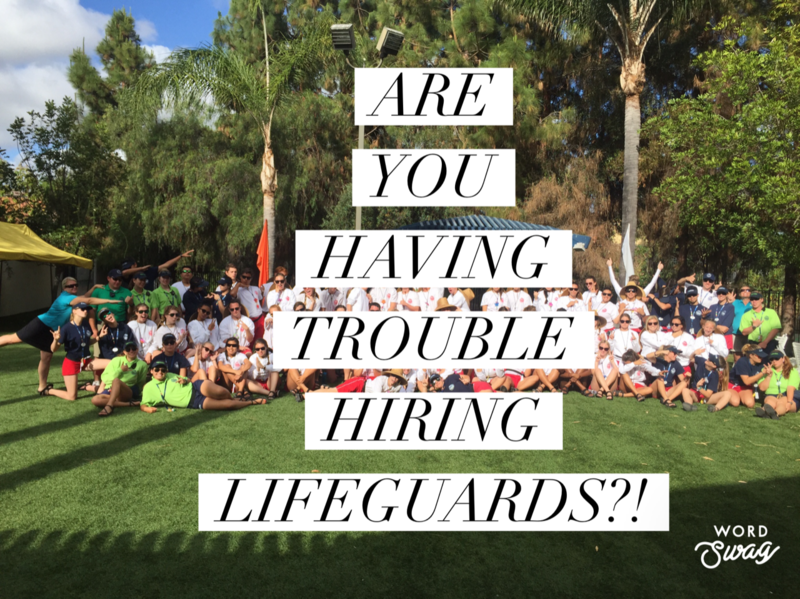 You are here: Home / Uncategorized / Are You Having Trouble Hiring Lifeguards? Let’s start with a simple statistic. There are more people aged 15-24 (generalized typical lifeguard age) today in the world that there ever was before*. So this issue isn’t there not being physical people available to do the job of lifeguarding. It is something else. If there are available people, why am I having trouble hiring lifeguards? Here are my thoughts / ideas on hiring lifeguards in 2019. First off, I don’t think you should start your thoughts with hiring, even if that is your biggest “problem”. I think you should start by looking at your retention. Eeek! Now that thought may sting a little, and feel a little judgmental from someone on the outside, but I want to be honest. And I see this as a concern ALL.THE.TIME. Here me out…If we can keep the people we have currently for longer, we have to hire less. It is simple math and it makes logical sense. Hiring new employees is more expensive than keeping the ones you currently have. What is our current retention rate? How can we work to improve our retention rate? Why are our lifeguards leaving? What would they need to stay? Are they being challenged? Are they being rewarded? Are they connected? Do I have a way to continue to teach them every year? Do I have a leadership development program even if I have limited positions available? Am I actively working to retain my employees? It is asking questions that may not make you feel the best, but it is super important to ask the right questions. I know the span of a typical lifeguard is relatively short, and most don’t make careers out of it (like we have apparently ;-), but if we can improve our retention rate every year I think we can make big strides and create a little bit of a buffer when the economy changes or other factors impact our hiring pool. Think about it, if you have a staff of 100 lifeguards each year and you have 30 return, you would have a 30% retention rate and you would then need to hire 70 lifeguards to resume or continue your operations. If you could increase that 30% to 50% retention rate you would only need to hire 50 lifeguards vs. the initial 70. Don’t overlook the lifeguards who are already in front of you! Removing friction is how Amazon.com has been successful. They understand that in the world we are living in we want/need things as quick and as easy as possible. They focus on how can they reduce the friction to get you to purchase from them because really this was the biggest struggle in switching to an e-commerce strong society. They have created buttons for reordering, voice detection ordering, one-click ordering, two-day shipping, reoccurring subscriptions, and who knows what will be next. They have prioritized convenience and we love it! Let’s face it…our hiring processes are filled with friction and hoops for potential applicants to jump through…but why? I looked at our process one year from an applicants perspective and thought, “Wow, I would never complete this task list if I was 16.” The applicant would have to fill out a form, bring in in, set up an interview, coordinate their schedule around the interview, coordinate transportation, show up for the interview, prepare, then if offered a position they would have to complete a pile of paperwork that was almost as much as it was for me to buy my first house, go to get fingerprinted, attend a physical and drug testing, schedule themselves for a lifeguard training, prepare for the lifeguard course, show up for the course, pass the course, complete the rest of their paperwork and show all kinds of identification, and then be scheduled for additional trainings….I mean would you be overwhelmed?…Why would I do all that for a minimum wage job? Now some of you may not have complete control over all of the steps that need to happen for your organization, but you can influence them. I created a relationship with HR, they let me try out new ways to streamline our hiring process and it worked! My main goal was removing the friction. I challenge you to put yourself in your hiring process and think about how you would feel as you walked through your hiring process. Think as a potential applicant; you are most likely in school, in activities and sports, dealing with friends and extracurricular projects, you are probably studying for finals or AP exams, and you live in a world where you can order anything you want from your bed…would you be excited about going through your hiring process? Some people have said to me, “Well, I want to see their commitment level and if they will be responsible.” I’d say judge that in another way, get them in the door first. Think about it, we personally do this all the time; I decided to order on Amazon today instead of going to the store in the rain. We are naturally lazy and take the path of least resistance, it doesn’t mean I am not responsible or committed, it means I value convenience and I make decisions based on the return on my investment. Challenge: reduce the friction in the hiring process, add convenience! What if…You posted an invitation for potential applicants to submit a short video (1-2 minutes) in lieu of an in-person interview. The video should share what is unique about themselves and why they want to be a lifeguard. Think about it…this is how we (and teens) communicate. Snapchat, Marco Polo, Instagram, Messenger…they use videos to connect and communicate. I think video submissions would reduce anxiety for young teens who have never interviewed, I think we would learn and see a much more real version of applicants, and I think it would be such an improved use of our time. What if…After the video was submitted and reviewed, you responded with a video back commenting on something special they said, how excited you are to invite them to join your team, and then a link to sign up for a lifeguard course with the follow-up in a few days if they hadn’t signed up yet. How much more connected and personal would that be to receive a personalized video message from your new Supervisor. The whole process 5 minutes or less per person, watch their video, reply with video, add a link, send. We need to communicate how people do naturally today. I don’t think formal in-person interviews are a requirement, and honestly, I think they take way too much time and give us minimal information about people. I think we could gather the same information, if not more from personalized videos. Think outside the box, think how you could update your methods to what is current and impactful today. Who is doing your recruiting? Do you have an opportunity to expand your recruiting team, and if you do are you willing to give them some creative license in how to reach awesome people? As a business, there is only so much reach I can legally do. We can do school visits at lunch if we are allowed, send letters to coaches, have job fairs…but there is so much more that is untapped. What if…our leadership team assist in the recruiting process in a challenge format? I outlined our hiring goals for each division and then placed my leadership team and some lifeguards in groups and created a healthy competition. I let them be creative, tell me what would work, and they steered the ship. Honestly, they had so many better ideas on how to reach people. They posted in online groups that I didn’t not have access to and didn’t know were there, they spoke in front of their church youth groups and sports teams directly, they connected with people at events I would have never thought to attend, or in the cool hang out spots that I was “too old” to know about. The challenge and the license to be creative paid off in huge ways, and it was easy for me too! I simply supported with materials or what they needed and provided the end competition prizes! Sometimes people have better ideas than we do, and we just need to get out of the way and let them contribute. Why should I work for you? Really, I’m honestly asking…because I could turn my brain off and flip burgers for more money? If you do not have a compelling vision and you cannot clearly explain how this job of lifeguarding connects to their purpose or in making the world a better place, then I think you have dropped yourself in the potential running for a lot of youth these days. If you can connect with a High School EMT prep class and explain how working as a lifeguard can improve their experience, I think you have a better shot of connecting with people than a generic “be a lifeguard” poster. How can working as a lifeguard improve their chances of being an engineer, or a teacher, or working in marketing, or being an entrepreneur? It can prepare people in amazing ways and has so much more legs than just flipping burgers can, but I think we don’t communicate this well at all. Today’s generation wants to feel connected to a purpose they want to understand the value they bring and what they are contributing to. What is your organization doing to make this world a better place? How will they serve others? Will working at your facility reduce the worldwide drowning rates? What is your mission? What special projects do they get to contribute in? Do your community programs make your community safer? Do you contribute to making memories and positive childhood experiences? I think we all know the value of aquatics, but reach deep and find a way to connect with that and communicate it. I think people will do harder things than flipping burgers if the purpose is there. They need to know the “WIIFM” or What’s In It For Me…and I can’t say I blame them. How do they want to work? Honestly, one of the biggest perks for teens these days is flexibility. Are you flexible or are you looking for only fully available people? I understand some aquatics operations are only seasonal, but even still, I think we could open up our potential applicants if we were more flexible and if we promoted our flexibility. What if…you promoted a lifeguard position as a shared position. Bring a friend, each of you will work 15-20 hours per week. They do the work of finding and bringing another person, they are more comfortable because they already have a good friend at work, and you get 2 people willing to contribute. I’d rather take a passionate person who is busy than someone who has nothing going on in their lives and is fully available. The people who are involved in sports, or band, or church, or extracurricular actives and hobbies are the people who know how to be reliable, know how to communicate and work well with others….those are the people I want on my team and if that means I need to be more flexible, then that is what I will do! I think a lot of potential applicants may be hesitant to apply because they don’t know what their summer is going to look like, they don’t have a baseball schedule, they don’t want to be booked solid after they worked all school year in AP courses, but if the job is advertised and delivered as flexible from the beginning, I think we will reduce the fears and open up to some amazing people! Do you have quality people in other areas? Do you have someone in the office who is amazing and is interested in leadership, and you could train as a lifeguard? Do you have a food and beverage lead who is looking for more hours? Do you have a fitness instructor who loves to connect with people? Sometimes you gotta be creative internally, especially in between recruiting efforts. Cross training may work for your organization and meet others’ needs too. It never hurts to ask, and sometimes people just need a little bit of encouragement to try something new! These are just a few ideas…but brainstorm…how can you update your hiring methods? How can you try something new? Listen, I know this is a hard topic…and it is even harder to operate with little staff. The game of lifeguarding is changing, just like everything else, and I think we need to look at our game plan and see what is actually working and take some risks on trying new approaches. The bottom line is that recruiting these days is hard, it does take effort. We can’t wave a magic wand and have lifeguards appear, we don’t have people lining up around the building for our job fairs…I don’t want to undervalue the frustration. I’ve seen it on many client’s faces, but I have also seen clients who are adjusting, staying positive, being creative, and in turn making it work and hiring the numbers they need. What have you done or are you doing to hire lifeguards in 2019? Share below!